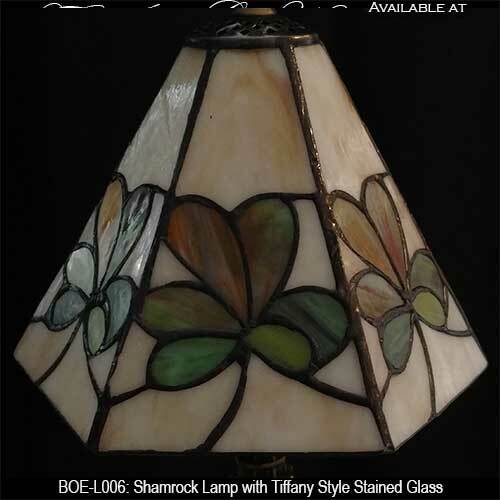 We assembled together some of our shamrock gifts that we offer as wall hangings and plaques along with ornaments and lamps. The shamrock is the best known symbol of Ireland and any Irishman will be proud to give or receive a gift that symbolizes this iconic three leaf plant. This section is an eclectic and diverse sampling of the shamrock gifts that are available at The Irish Gift House. 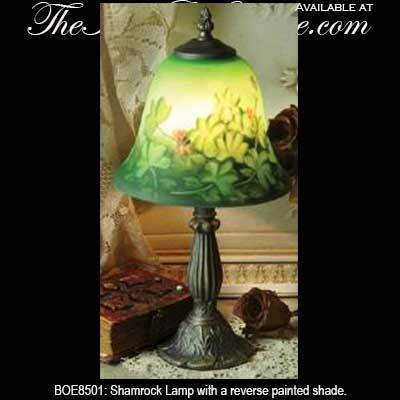 This Irish lamp features a reverse painted shamrock design. 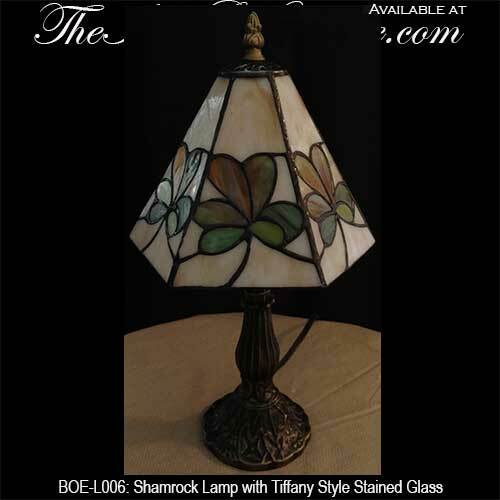 This stained glass shamrock lamp is ideal as an accent or desk lamp. This Céad Mile Fáilte Irish welcome sign features shamrocks along with Celtic Trinity knots. This Double Layer Irish Throw Blanket features Shamrocks on both sides. This Double Sided Shamrock Throw Blanket features green shamrocks on one side and cream shamrocks on the other side. Galway Irish Crystal Shamrock Wedding Bell. 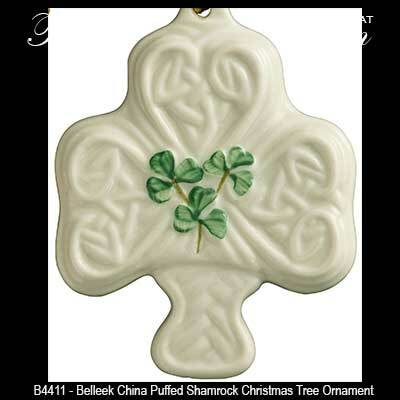 The Belleek shamrock shaped wall plaque features hand painted shamrocks. This Shamrock Wall Hanging with an Irish Blessing has an Antiqued Copper Plated Finish. 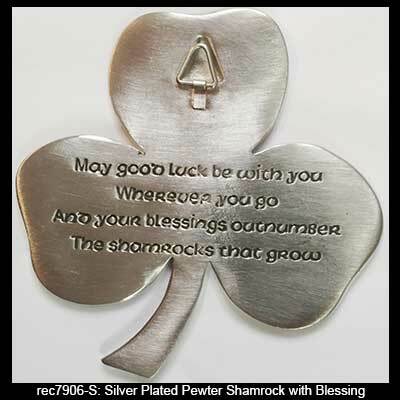 This silver plated shamrock wall plaque features an Irish blessing on the back. 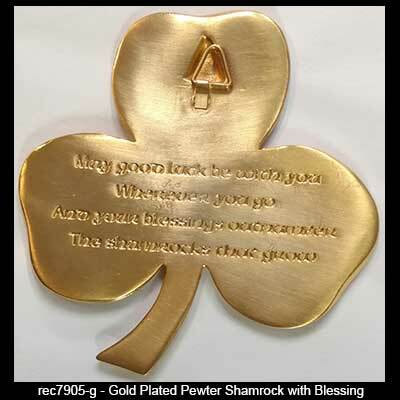 This gold plated shamrock wall plaque features an Irish blessing on the back. 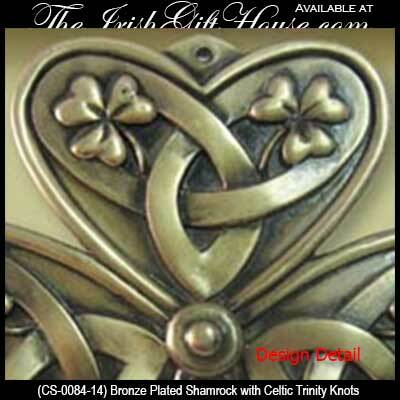 Irish Gifts - Bronze Shamrock Wall Plaque with Celtic Trinity Knots. This brass Irish desk bell futures embossed shamrocks. 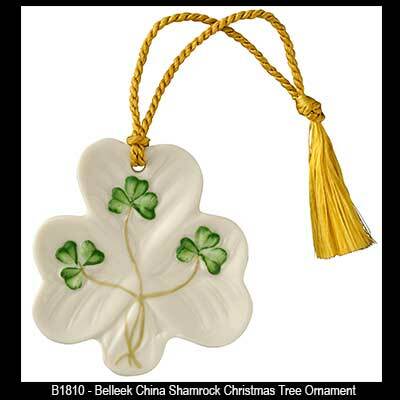 Irish Belleek China Shamrock Shaped Christmas Tree Ornament with Celtic Knots. If you prefer silver than please take a look at our selection of silver shamrock earrings that are available as stud or drop styles. Many of our complementing silver shamrock necklaces are accented with Connemara marble. Known as Ireland's gem stone, we offer a generous selection of Connemara marble necklaces with varied Irish and Celtic symbols that is not limited to the assortment of Connemara marble crosses. The Irish Gift House features an abundance of Irish Gifts for every and any occasion, but we may be best known for our wealth of Claddagh Rings and Celtic Wedding Bands. We are also a market leader serving the strong demand for Celtic crosses providing a vast range that incorporates Celtic cross necklaces and Celtic wall crosses. 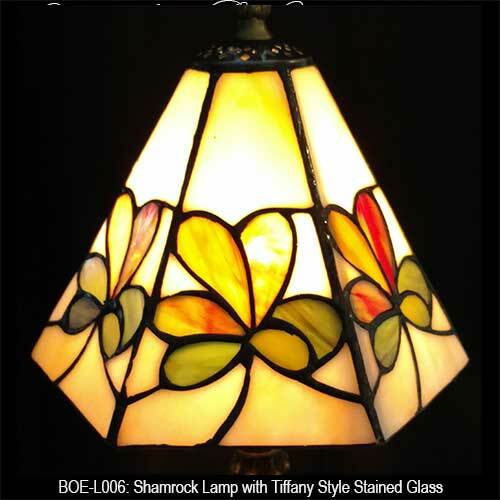 If you are searching on-line for Belleek along with Irish Jewelry and Celtic Jewelry, you have found the right place as we have a considerable assortment that is proudly made in Ireland. Follow us on Twitter, Google+ or Facebook to keep up-to-date. You are also welcome to visit and comment on our BlogSpot and you may also read our many five star Google reviews and you may review us too!